In the United States, the coat should be shown in a rustic style with no fluffing or blowing out. The coat should match the lines of the dog and the curls should be evident. The dog should have the appearance of a working dog that it is. 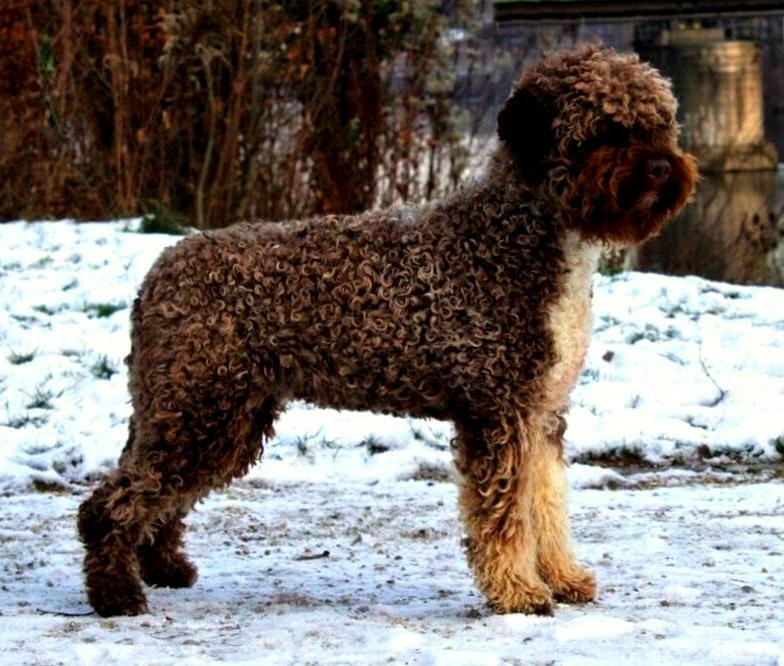 The water-proof coat of the Lagotto Romagnolo appears rough and forms thick, tight curls that cover the entire body (except for the head). The traditional colors are off-white, brown, and orange. Some Lagotti have a white coat with brown or orange colored markings. Lagotti have a double coat of very curly hair. They do not require frequent bathing, typically about once a month. The coat is best when kept at about 1 to 1.5 " in length. 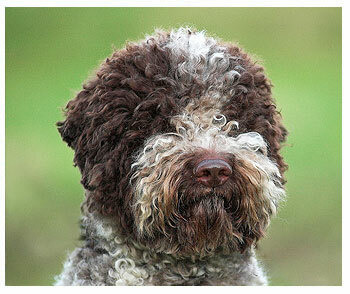 Lagotto Romagnolo do not shed regularly and may leave little tufts of hair once in a while. Because they have hair rather than fur, it has to be trimmed occasionally. Show dogs are trimmed down and left to grow out naturally before showing or they must be tidied up before showing. 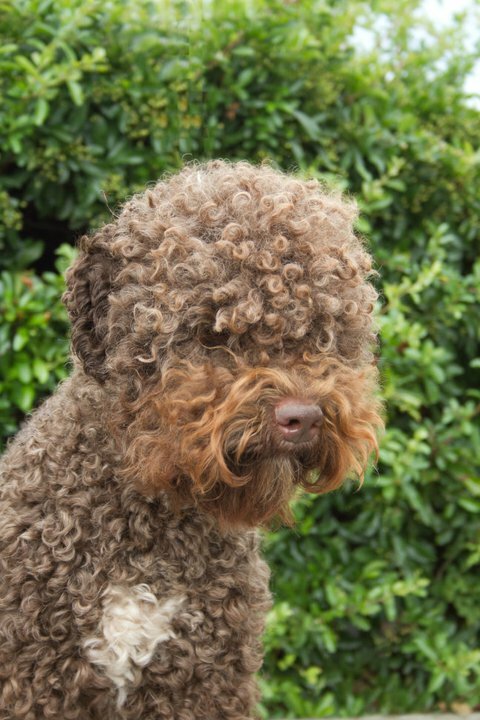 The signature look of the Lagotto Romagnolo is the tight curls that fit the body. They are to be shown as a natural rustic looking dog with no blowing, fluffing or brushing out of the hair. 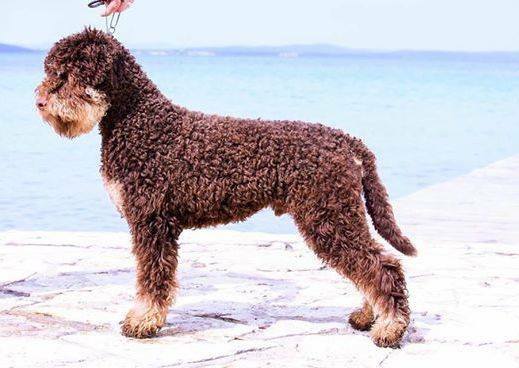 For showing in the United States, the coat should appear in a rustic style and it should match the lines of the dog so that the curls are evident. Hair on the ears should be trimmed around the edges to the leather. If the ear shows irritation and buildup of dirt and earwax, the hairs from the ear canal should be gently plucked out regularly. Some coats matt easier than others. Given the type of coat, with continuously growing hair tending to become felted, it is important to groom regularly, for the dog's benefit and to prevent various troublesome problems.